Singo Katanga (center) has come to the village to raise awareness of good hygiene in a process known as ‘triggering’. She gets villagers to draw a map of the area, showing the main features like the road and the river. In this village close to Lake Malawi, a lack of decent toilets is not the only reason people do their business in the bush. The main challenge here identified by the Global Sanitation Fund Sub-grantee Hygiene Village Project is that houses are spread out over a large area. As villagers are widely dispersed they use different spots to poop. When the community is triggered to change behavior and commits to ending open defecation, it's going to be hard to keep tabs on offenders over a broad area. Singo’s a health worker trained in the CLTS approach to stopping open defecation. Thanks to her CLTS experience, specific local challenges are tackled in order to empower communities to take the lead on improving sanitation in their own village. 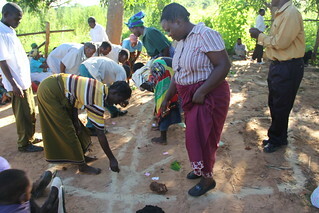 The Global Sanitation Fund finances CLTS trainings through a local coordinator, Plan Malawi, the Executing Agency. In this way the expertise of people whose entire career has been spent in the sanitation sector means local issues are treated with sensitivity. The health workers know behavior change starts with individuals but works best when the entire community commits to ending open defecation. The tremendous energy of the trainers from the Hygiene Village Project NGO meant that this particular triggering, although identified as a challenging scenario, went off with a bang. Because of the sprawling nature of the village, it’s going to require more attention during the follow up than most. But with good oversight, the firm commitment of the village chief, determination of the village and dedication of the health workers, the challenges in this village to stopping open defecation may well be met.